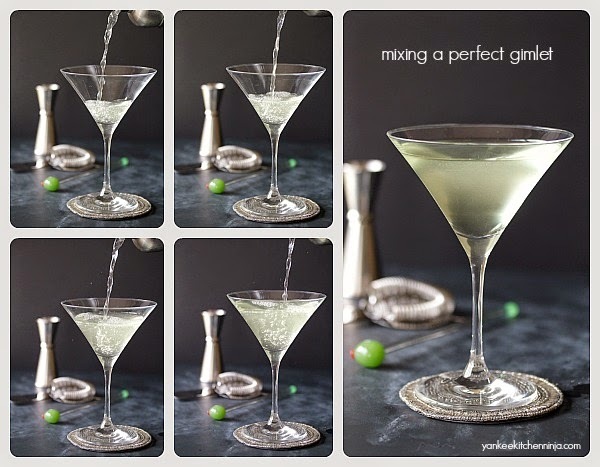 Learn how to easily shake up a perfect gimlet with your choice of gin or vodka. 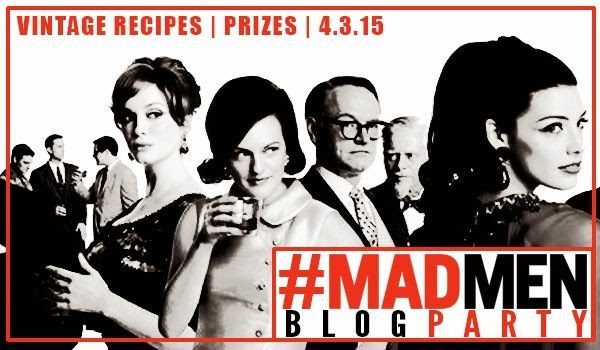 Are you ready for some Mad Men? And do you have your cocktail shaker locked and loaded? I'm torn about this final season premiere. I'm excited that the show is back but I'm also sad that the whole shebang is coming to end. However, I'm a firm believer that when a show is good, it should end gracefully, on a high, rather than continuing on ad infinitum until it jumps the shark. One of my favorite things about Mad Men (me and about a gajillion other people, I know) is the authentic mid-century feel of the sets and the costumes, as well as the characters' behaviors. And while those behaviors are not all admirable (e.g., smoking like chimneys), I think they did a lot of things right in the 50s and 60s. Ah, classic vintage cocktails. No frou frou wine spritzers or pink umbrella drinks for the Mad Men, no sirreebob. (Can you imagine Don Draper ordering a skinny margarita?) And while Roger may have a weakness for a martini (or six) and Don his Old Fashioneds or Manhattans, mine is the same as moody ice queen Betty Draper Francis': the gimlet. On this blog, my love of cocktails is no big secret. One Mad Men-era tradition we observe around Casa de Ninj is cocktail hour, and the house favorite, hands down, is the gimlet. Not only simple to make, with only two ingredients, gimlets are the most beautiful shade of celery green that you'll ever see. In fact, I once painted our living room what I dubbed “gimlet green”, although I didn't go so far as to bring a shakerful with me to color-match at the paint store. 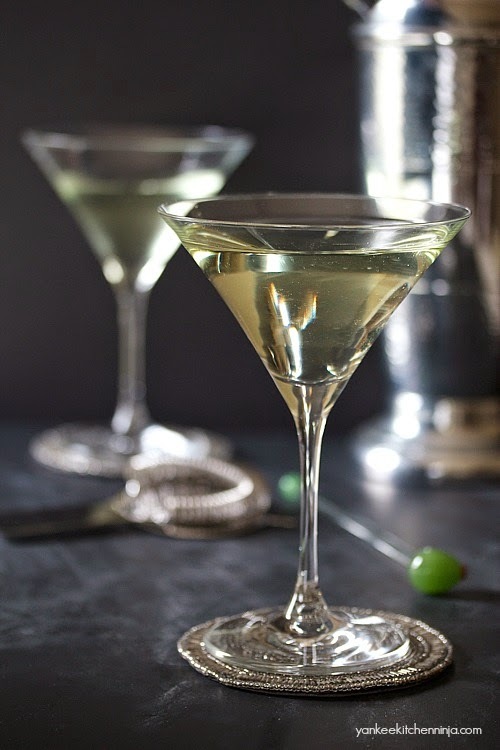 Traditionally, gimlets are made with gin. As I've never been a big fan of gin (too juniper-y for me), I tend to shake up a vodka gimlet instead. Please note my verb choice: perfect gimlets are always shaken and served in beautiful stemware, never callously dumped over ice in a highball glass with a wedge of lime. However, I recently discovered (late to the party, as usual) Tanqueray Rangpur gin, which is way less herbal and has a hint of fresh lime. And oh, that hint of lime makes a gimlet sublime! Whether you prefer gin or vodka -- my fave brand is Luksusowa -- the recipe is the same; just pick your gimlet poison. Are you a Mad Men fan? More importantly, are you a fan of vintage cocktails? And most importantly, are you a gimlet lover? Leave a comment: The Ninj wants to know. Fill a cocktail shaker about half full with ice cubes. Shake vigorously to break up some of the cubes. Add the liquor, lime juice and water and shake again. 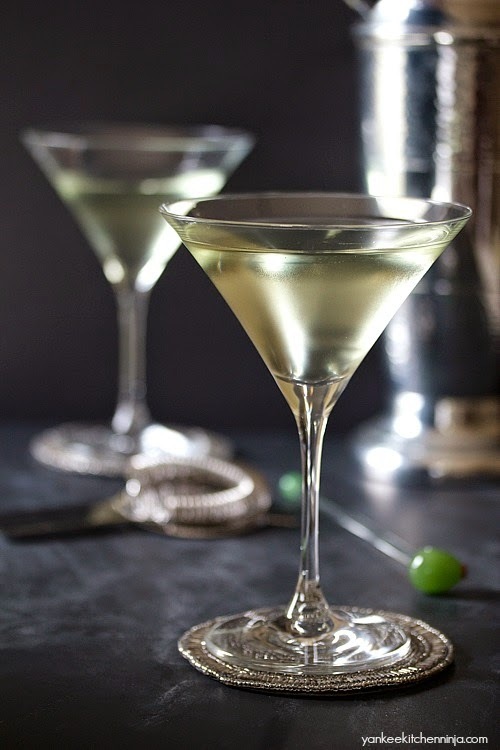 Strain into 2 martini-style stemmed glasses. This gimlet is stunning. I can't wait to perfect this cocktail in my own kitchen. I'm so excited for the premiere! Pinned. Thanks, Jennie -- I was pretty excited about the photos. I'm psyched for the premiere, too! Perfect is the only way to describe this. Beautiful photos! Hope you enjoy it, Claire -- it's my absolute favorite (and SUCH a gorgeous color)! Going to have to find that gin because you're right that the usual Tanqueray is a little too herbal for a gimlet. Great cocktail for a vintage party! It's wicked common, Carrie, so definitely give it a try -- it makes the gimlet that much more yummy! Good thing it's the weekend, Tammy! I'm so with you when it comes to going out with a bang with your head held high when it comes to TV shows. HIMYM, Greys... such disappointment in shows that should have ended a season or two before it did. Well, I stopped watching after season 10 of Greys. I should have stopped watching after Mark and Lexie. All downhill from there. I'm totally with you on the gin thing!! Love this gimlet! Favorite character is definitely Peggy. 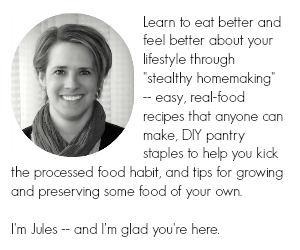 I'm a Roger fan, myself, Pam! Perfection! Betty's fave! I love a good gimlet. You've inspired me to go back to a classic cocktail with this post, Julianne! What's not to love about vodka and lime juice?!? Exactly, Bill -- the classics are the classics for a reason, right?!! Enjoy! First and foremost, I love your Fonzie jumping the shark reference. +10 for that! I'm with you on the end-it-on-a-good-note. I can't stand when series keep going for seasons beyond when they should've ended (I kind of feel like The Office did that).